Aromatherapy facials are pure indulgence! 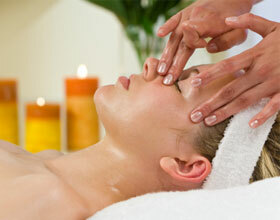 They combine a soothing facial massage with therapeutic essential oils and natural plant extracts. These help to detoxify the skin, providing vital nourishment to it’s deepest layers. Every skin is different, so products will be chosen to benefit your skin type giving instant rejuvenation. The products used are from the Aromatherapy brand, Eve Taylor. They contain high quality natural essential oils with no mineral oils, SD alcohols, artificial additives, nor are they animal tested. This blissful treatment tones, refreshes, revitalises, leaving the complexion instantly bright and radiant….mmmm!